The modern era of talking animals in literature is generally believed to start with Lewis Carroll’s Alice’s Adventures in Wonderland (July 1865). That is the oldest novel still commonly published today, and the earliest that people (both children and adults) read voluntarily for pleasure. Yet there were quite a few stories in the late 18th century with talking animals. Fabulous Histories. 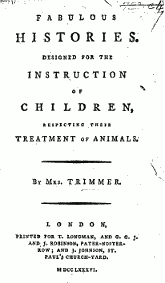 Designed for the Instruction of Children, Respecting Their Treatment of Animals, by Mrs. [Sarah] Trimmer. London, T. Longman, G. C. J. and J. Robinson, and J. Johnson, 1786, xi + 227 pages, 1/-. Before about the 1750s, popular attitudes toward animals were about the same as toward inanimate objects. Children were allowed, if not encouraged, to treat pets and other animals as breakable toys. As an aspect of the Age of Enlightenment, such tormenting of dumb beasts began to be considered as cruel. One result of this was the development of uplifting children’s literature. Books were written for parents to give to their children for their moral edification, as didactic lessons of virtue and kindness to animals. One of the most popular of these was Mrs. Trimmer’s Fabulous Histories, which went through many editions from 1786 to late in the next century (retitled The History of or The Story of the Robins during most of the 19th century). A similar classic was Dorothy Kilner's 1783 The Life and Perambulations of a Mouse, in which Nimble the mouse relates his autobiography consisting mostly of being the victim of cruel pranks by children. Children continued to tie cans to pets’ tails into the 19th century, but after about 1770 they Knew It Was Wrong. Mrs. Trimmer was careful to emphasize in her Introduction (as the other authors did in their introductions or forewords) that the story is a fantasy, because animals cannot really talk. She did not allow Fabulous Histories to be illustrated during her lifetime (1741-1810), for fear that pictures of the birds engaging in conversation would overly confuse children. Despite this warning, some parents worried that reading Fabulous Histories would lead children to believe that birds could talk; in Mary Wollstonecraft’s 1788 Original Stories from Real Life, a mother giving her child Fabulous Histories emphasizes “that birds never talk.” Apparently the grownups of this time were seriously concerned that stories of talking animals would be believed by children to be factual! As late as 1931, Alice in Wonderland was banned in China because it contains talking animals and therefore teaches an unreality. The mother Redbreast lays four eggs, which their father views with pride but concern. Master Frederick collects a bit from each of the servants’ meals instead of taking fresh foodstuffs for the birds. Mrs. Benson approves of this moderation. Meanwhile the birds are getting along in their nest. Fabulous Histories is also of interest for its picture of social customs of the era. The Bensons are an “average” family with the usual servants; a footman, a cook, a gardener, a coachman, etc. Those who do not have live-in servants are the miserably poor people, to be pitied. When Joe the gardener finds the Redbreasts’ nest high up in the wall, and the children beg to see it, Master Frederick is freely allowed to climb a ladder to do so; but Miss Harriet is only reluctantly given permission – climbing ladders is very unladylike. (The baby birds excitedly tell their parents about the giant monsters who looked in upon them.) The human children speak in a manner – “For shame! Master Jenkins, said Miss Harriet, how can you talk in that rhodomontade manner? I cannot believe any young gentleman could bring his heart to such barbarities.” (p. 53) -- which is either exaggerated by the author, or evidence that upper-class children of that time had a much more educated vocabulary than they do today. The narrative is full of incidents as seen from the robins’ point of view of human children carelessly or maliciously using them as playthings, to be casually discarded when they “break”. Other menaces are acknowledged, such as a hawk, but it is made clear that these are natural predators merely following their instincts. Only humans know the difference between right and wrong, and mistreat animals through deliberately callous cruelty. The novel alternates scenes featuring the Redbreast family and the humans. The Benson children are contrasted with their thoughtless playmates who bring nests of baby birds home, at best not meaning to hurt them but invariably resulting in their starving to death in a few days; and who throw rocks and do worse to any cats, dogs, or domestic fowl that they catch, pull the wings off of flies, and so on. A different example is that of lonely but rich Mrs. Addis, who coos over her beloved pet parrot, parakeet, macaw, squirrel, monkey, kittens, and lap-dog, but who relegates her own young children to the back rooms and her servants’ indifferent care. Her daughter Augusta is understandably jealous of the pampered animals. Mrs. Benson points out to Harriet that it is just as wrong to spoil animals as to mistreat them. 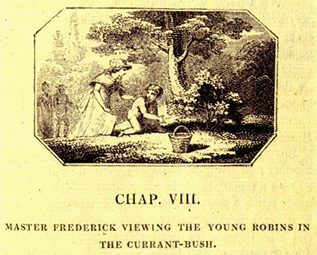 Robin is crippled and believed by his family to be lost, but is rescued by Master Frederick. When the other robins find him, they are encouraged by the kindness shown to him to enter Frederick’s room themselves. Frederick is rewarded by seeing the robins explore his room and come and go freely through the open window, in comparison to the sterile life of Mrs. Addis’ caged pets. The Redbreasts introduce their children to the other birds of the neighborhood; the Linnets, Sparrows, Chaffinchs, and more. They have edifying encounters with other cruel human children and adult professional bird-catchers who show that not all humans are as kindly toward animals as the Bensons. Ultimately, the Redbreasts grow up free and happy as wild birds should be. What happens to the humans is also summarized; Harriet and Frederick Benson become pleasant and well-liked adults, while the others in the story meet fates that are foretold by how kind or cruel toward animals they have been. The span of the popularity of Fabulous Histories approximately ended around the 1880s when three things occurred: less condescending children’s literature became available; social customs described in the story became blatantly outdated; and society generally evolved from rural to urban, making the be-good-to-animals message largely irrelevant. Can 'The Wild Life' get any wilder?